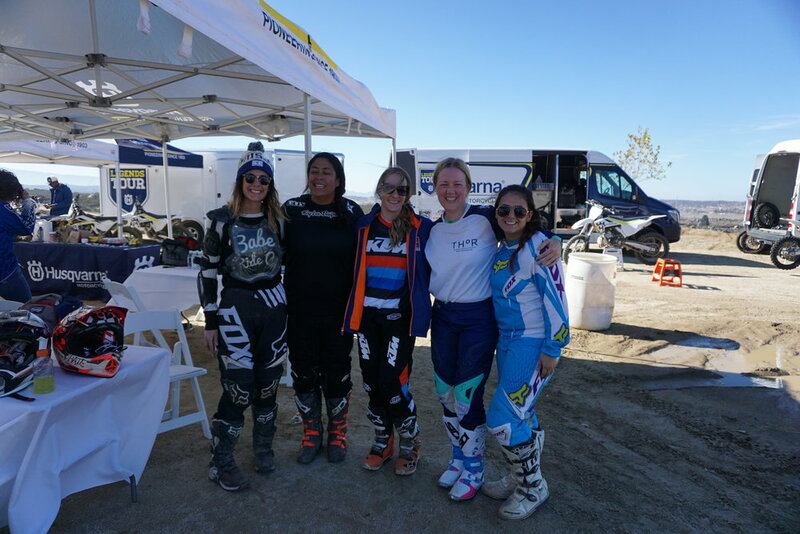 When your moto family invites you out for a womens ride day at Cahuillo Creek you say YES!!! We had the track to ourselves this past December for a day of grabbing all the ladies that work in the Husqvarna offices plus a few lucky souls such as myself and hitting the dirt. Some had never been on a dirt bike before and it was so rad watching them conquer the mini technical course that the team had set up. Throughout the day they built up their confidence before they were ready to try their hand on the vet track. The full fleet was out and available to demo that day. I spent a lot of time on the TE 250 myself, as I am a two-stroke girl at heart, but I also got to ride the FC 350 and the TE 150 with a Rekluse clutch. After riding my vintage bike so much these modern machines feel like a dream come true! Ashley Fiolek is just about the sweetest person you could ever meet! I tagged along with her and a group of about 5 or 6 ladies as we left the table tops and sweeping turns of the vet track to take a rip on the single track off-road loop that is tucked away behind the track. I didn't really know what I was getting into but it didn't take long to fall into a rhythm of tight turns and hopping over mini boulders on some really fun and technical sections. This was my first time riding at Cahuillo Creek and I had heard a ton of great things about the vet track there but no one told me about this awesome secret single-track section in the back. It was the highlight of my day! This was one of the first times that I have been able to play on a track like that with such few people on it. It was an absolute blast to hop on a track I have never seen and a bike I have never ridden and spend the day working on technique and trying out different lines to find the fastest lap I could. I am a sucker for taking the outside line on a turn so on this day I was forcing myself to practice the inside line where I thought it might be a faster route. There was one step up jump in the back of the track that was pretty peaked at the top and would kind of launch you whether you liked it or not. After rolling it a few times I thought I would gas it a bit more which landed me about mid way onto the landing and I could feel the suspension compress as I landed pretty hard. After watching a few of the fast girls completely clear it I realized that this is one of those mind over matter type of obstacles that is really much easier and smoother if you just go faster over it. The step up had a nice rounded landing and if I could just land more toward the flat part I would be in good shape. As the day went on I gave it a bit more each time but definitely did not quite clear it. I guess I will have to save if for another day. This particular table top was one of my favorites! Perfect line up, perfect landing and sent you right into a tight turn right after. So much fun! Looking forward to spending more time on this bikes at Babes in the Dirt 3 on April 28th-30th! See you there!